A nuclear armed Iran would be dangerous to all humanity, says Peres in meeting with IAEA head in Vienna. 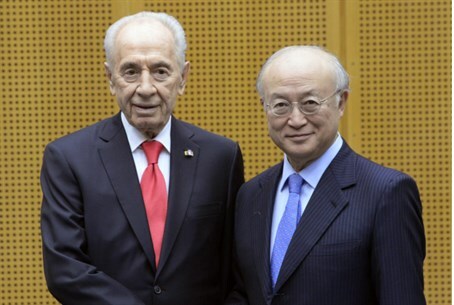 President Shimon Peres warned on Monday that a nuclear armed Iran could lead to “another Hiroshima”. The comments were made during Peres’s meeting in Vienna with the head of the International Atomic Energy Agency (IAEA), Yukiya Amano. “It's time to put the facts on the table and realize that nuclear weapons by the Iranian leadership would be a danger to all humanity,” Peres said. Under an interim agreement signed between Iran and the West in November, Iran committed to limit its uranium enrichment to five percent, halting production of 20 percent-enriched uranium. In return, the European Union and the United States have eased crippling economic sanctions on Iran. In return, Iran is gradually winning access to $4.2 billion of its oil revenues frozen abroad and some other sanctions relief. The funds will be paid out in eight transfers on a schedule that started with a $550 million payment by Japan on February 1. Iran and the six powers - the United States, Russia, China, Britain, France and Germany - want to turn the November deal into a lasting accord by July. The IAEA has been holding regular inspections of Iran’s nuclear facilities. Several weeks ago, the atomic agency said that so far, Iran is complying with the agreement and sticking to the partial nuclear freeze to which it agreed. At the same time, Amano several weeks ago said that while Iran is reducing its most proliferation-prone nuclear stockpile as required by the deal, much work remains to be done to resolve all concerns about Tehran's activities.